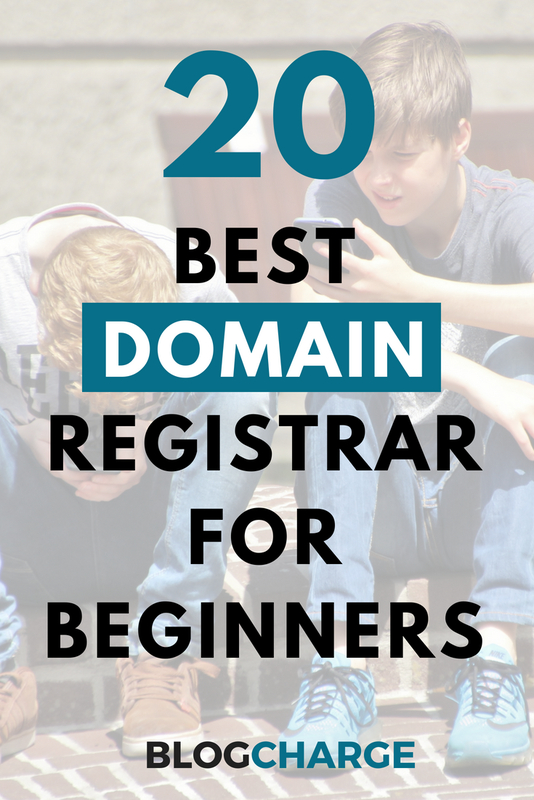 20 Best Domain Name Registrars in 2018: Which One to Choose as A Beginner? You finally decided to roll. Start an online business or blog website which can help you escape your current 9-5 job. But, as it happens with everyone, you’re clueless and don’t know where to start. What should be the first step to start an online business? Let’s make it simple for you – the first step is to buy a domain name. Simple isn’t it? Your domain name is one of the things that will stick for long and should be as brandable as possible. iamthebestdentistinnewyork.com may sound satisfying, but in the longer term, it’s useless and doesn’t look professional. You want your domain to be personal, niche-related, shorter, and brandable at the same time. How would my little brain think of such name? Stop brainstorming, you can use these domain name generator tools to come up with a great name. Excellent! Now you have a domain name in your mind (or paper), what’s next? We need to own it. How? By registering it and paying a fee through a domain name registrar. Domain Name Registrar is an online service that allows us to purchase, register, and manage domain names. Internet Corporation for Assigned Names and Numbers (ICANN) is a non-profit assigned the responsibility to maintain domain names which provide accreditation to Domain Name Registrars. Without a proper domain name system (DNS), it’ll be difficult to access websites on the internet. For instance, if you wanted to access YouTube, instead of typing the name, you’d enter http://172.217.10.46/. So, having DNS make sense and domain registrars make it easier to check available domain names and purchase it for further use. What the question remains is “what are the best domain name registrars?” Some are expensive than others, some lack essential features, or aren’t user-friendly. To make it simpler for you, we have created this list of hand-picked best domain name registrars in 2018. Let’s get started. Note: The prices mentioned below may change, and occasional offers are going on for several of these websites. So, make sure to check the website and pricing yourself before making a final decision. If you’re looking for the most extensive collection of domain extension with affordable pricing, NameCheap is my go-to suggestion. It was founded in 2000 by Richard Kirkendall, which makes it one of the earliest domain name registrar in the list. Registering a domain name with NameCheap is straightforward with their simple user interface and guided instruction. Customer support is excellent and very responsive for both pre-sell and post-sell questions. Largest collection of lesser-known extensions such as info, biz, co, etc. If you ask me to pick my current favorite domain registrar, I will pick Dynadot. One of the easiest to use domain registrar with affordable pricing and market best features. Being a multi-service provider, it also offers web hosting, website templates, and a domain marketplace to buy expiring, deleted, and premium domain names at one place. Started in 2009, NameSilo quickly found it’s placed in top domain registrars because of the pricing. It’s mostly popular among seasonal domain buyers as it offers bulk purchase discounts. The design of the website makes you feel you’re in early 2000, but the user experience isn’t bad. It was also among the first to offer free WhoIS privacy whereas others were charging a fee. If you’ve been using the Internet for some time, you must have already heard about GoDaddy. It’s easily the world’s largest domain registrar with over 72 million domains registered. With their ongoing offer of 99 cents domain names (for the first year), they manage to get small businesses to get on board. Along with the domain, customers can bundle their purchase with cheap web hosting and website designer. However, the renewal cost is higher than other registrars, and they are known for aggressive upselling. 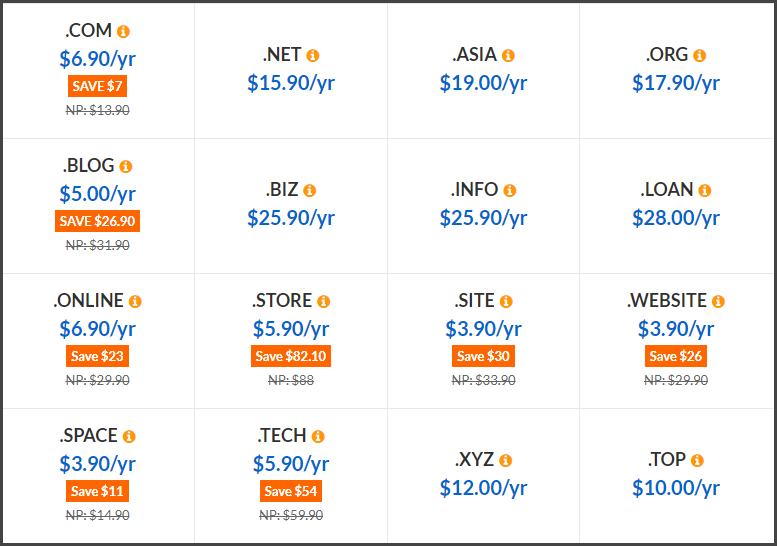 Their website isn’t very clear about pricing so here’s a quick comparison table between GoDaddy and NameCheap to provide you a better idea. Although EU’s General Data Protection Rule has made it compulsory to offer free whois guard or protect the information, GoDaddy is yet to apply this change. The domain privacy protection costs a massive sum of $7.99/year, and domain privacy + business protection requires $14.99/year. A domain registration service from Search Engine giants itself, Google Domains is the simplest to use in the list. Unlike other domain name registrars, Google Domains focuses merely on selling domains with few extra optional services like G Suite. The website is still in beta so there’ll be more features available in the future. If you’re looking for a focused domain registrar with good user experience and transparent pricing, Hover is what I would suggest. Based in Canada, Hover provides only one service, i.e., Domain management. They don’t upsell or offer bundled services to make things confusing. Started back in 1999, Gandi is one of the oldest domain name registrars in this list. Till date, they have managed over 2 million domain names and websites. Along with domain registration, they offer simple hosting, cloud hosting, and SSL certificates. The website is modernized and provide the excellent user experience. If Gandi.net didn’t make you feel already, 1and1 surely will. It was started in 1988 making it the oldest contender in the list. It is owned by a German internet service company which goes by the name United Internet. In addition to domain registration, web hosting, online marketing, email solutions, web security are other services provided by 1and1. It is another popular domain registrar who offers multiple services including web hosting, SSL certificates, and email solutions. The service is owned by the parent company called donuts.domains – a leading domain name company. There isn’t any unusual or groundbreaking feature to list about this registrar. Popularly known for providing affordable web hosting, BlueHost can also be used to just register a domain name. It is owned by parent company Endurance International Group (EIG) – which owns many other online hosting providers. The website design is good and easy to navigate. Also, the pricing is affordable with a .com domain priced at $11.99. However, the whois privacy is an optional paid service which costs another $0.99/month. If you want to start a blog and host it at the same place (without dealing with nameserver setup), BlueHost would be a great choice. Additionally, if you buy BlueHost web hosting for 1-year, you get a free domain name. Owned by the same parent company as BlueHost, HostGator is another popular low-cost web hosting provider which allows domain registration. However, unlike BlueHost, there’s no such option to get a free domain name with purchase of web hosting packages. Also, privacy protection needs to be bought separately cost $14.95/year. Founded in 1994 with headquarter in NY, America, Register.com is a multi-service provider. It is owned by web.Com Group, Inc.
Alongside domain names, they sell web hosting, e-commerce services, SSL certificates, email solutions, and online marketing. They do run some offers for domain registration and the first year pricing is just $5 valid for customers from the United States and Canada. However, the domain protection isn’t included with that price and costs another $11/year bringing your total cost at $16 for first domain. Domain transfer is fixed at $12 which allows you to keep the remaining months of the domain and one extra year. When it comes to WordPress hosting, SiteGround is my all-time favorite web hosting provider for beginners. It offers great customer service, affordable price, seamless uptime, and other industry-best features. Unknown to many, it also offers domain registration as a separate service. The pricing for popular domain name extensions starts at $15.95/year. Sadly, the domain privacy isn’t included with a domain name, and it will cost an extra $1/month to protect your information from spammers. However, if you’re planning to start a blog with reliable web hosting and domain provider, SiteGround hosting should work out for you. If for particular reasons you hate web hosting providers owned by EIG and want a trusted web hosting company which won’t sell itself, InMotion has got your back. Along with different types of hostings, InMotion also offers domain registration as a service. The domain pricing starts at $14.99/year for .com domain extension without privacy protection. Transferring domain from other web hosting providers to InMotion hosting will cost $14.99. Buying privacy protection will set you back by another $9.99/year. However, if you purchase a 12-months or 24-months web hosting plan, you can avail a free domain name or one free domain transfer. Technically, Flippa is a marketplace to sell domains, websites, apps, and Amazon FBA business. However, it’s a great place to find some fantastic brandable domain names and grab it before your competitors. Flippa works on a bidding system so multiple buyers can bid on a listing which is sold to the highest bidder. There’s also a Reserve amount which you can pay directly to grab the domain name. Once you’ve bought the domain, the owner will either transfer it to your account at the registrar, or you can get the transfer code to move it on yours. It is a leading domain name registrar since 1997 (that also happens to be my birth year, wink, wink), which provides multiple online services such as hosting, web security, website development, email and apps, and others solutions. The pricing of domain names is as follows where RGP stands for Redemption Grace Period – the cost of recovering a domain name after expiry. Whois privacy isn’t included with domain price and costs extra $8/year. Being the world’s largest domain marketplace, Sedo is a great place to buy expiring, expired, and premium domain names. Here you can browse listing by other sellers or sell your own brandable domain name for reasonable prices. It doesn’t have its personal domain registration service, but they help you quickly transfer the domain to your registrar after the purchase. They also offer free domain parking where you can earn money for your domains which aren’t in use. BigRock is India’s #1 domain name registrar which offers competitive pricing and cheap domain names. It is especially helpful for Indian bloggers and small businesses who want to buy a domain name but don’t own a credit card or international debit card. Privacy protection is charged extra at $5.49, and you get 2 free email IDs with every domain name. If you want to buy a domain for cheap, Exabyte can set you up with a .com domain for just $6.90/year. It’s a multi-solution provider company that offers web hosting, web design, server, security, and other services. Domain privacy costs extra, but I didn’t saw any option to add it while ordering, so it’s a probably available in domain management dashboard. They offer multiple services in addition to being a domain registrar such as web hosting, email accounts, SSL and security, and online marketing tools. That’s it. 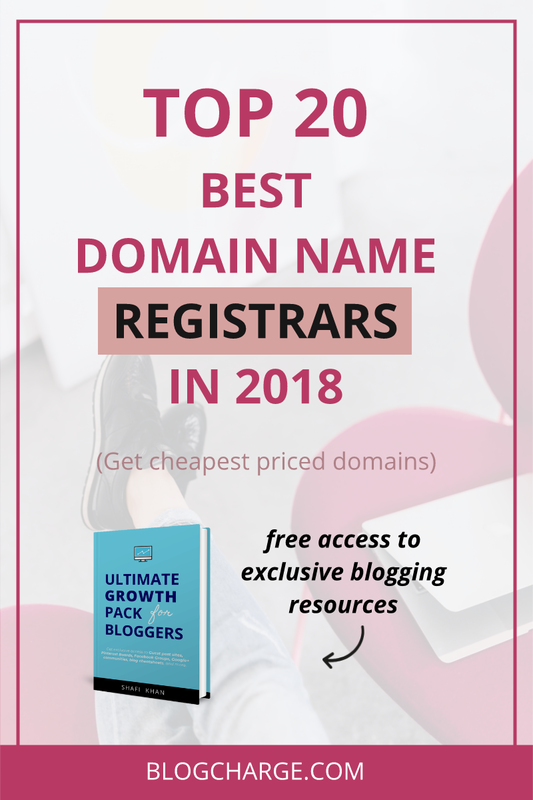 These were my hand-picked list of best domain name registrars in 2018 to buy/transfer a domain name. However, there thousands of more such registrars working currently. Want to check how many? Here’s the complete list of ICANN-accredited domain name registrars. If you’ve some more time to kill and want to make an informed decision, keep reading where I discuss the features to look in a domain registrar, what to avoid, and my top 3 choices. If you’re new to the internet world, it’s essential to start with the best and have a smooth experience rather than going for the challenging route. Here are few of the features to look in a best domain name registrar. 1. Pricing and Contracts: Unless you’ve money to burn, a registrar with most affordable pricing and without any contracts should be your ideal choice. Domain pricing can start for as low as $0.99, but if it asks for 2-year purchase, it’s not a good deal. 2. Free Whois: Domain privacy is essential to save yourself from unnecessary spam calls and emails. It also keeps your personal information (email, address, and phone number) safe. Also, since it has been mandatory by EU’s GDPR rule, why to pay extra? 3. Easy Domain Transfer: For some reasons, you may want to transfer your domain to some other registrar. But some registrars will try to lock you in with a complicated process. Make sure to ask the complete process with customer support before ordering. 4. Customer Support: Being a newbie, you may face some issues with technical terms or setting up nameserver, customer support will help you in such cases. It’s an excellent practice to casually talk and test the customer support before ordering any service/product. 5. Additional Services: Although experts recommend to keep the domain and hosting separate, maintaining all things together is suitable for beginners. Buying hosting, domain, web development, etc. from the same provider will make things easier to manage. 6. Grace Period and Renewal Alerts: If you forgot to renew your domain, there’s a period (called grace period) in which you can get it again by paying an additional fee. Some registrars don’t mention the grace period which puts your domain to risk. In addition to a suitable grace period, the registrar should also send multiple renewal alerts, preferably 30-days before the expiry date. There are few “avoid me” points to take note of when choosing a registrar. 1. Upsell: If the domain itself is cheap, the registrar will try their best to upsell other products to make up for the cost. While some of this service may genuinely help you, most won’t. Make sure to untick all the additional services/products when purchasing a domain name. 2. High Renewal Cost: Renewal cost for a domain should be equal or little higher than the registration cost. If it’s double or higher, it’s a good idea to either avoid the registrar or transfer before paying for the 2nd year. 3. Transfer Fee: Ideally, the transfer fee is the same or lower than the registration fee and gives you an additional year + remaining period of the current domain. If it’s not the case, avoid the registrar. 4. Paid Whois: As discussed, Whois protection should be included with the domain price. 5. Poor User Experience: The last and most important reason to avoid a domain name registrar is poor user experience. It should be beginner friendly with proper instructions and easy to navigate. Registering the domain name is the first step towards starting an online business, and it should be as seamless as possible. If the prices are too high or procedure to register a domain is complicated, it’ll stop masses from getting started. With these best domain name registrars list, you can be assured to get a fantastic experience, support, and reasonable pricing. What was the first domain registrar you ever used? Let’s discuss and see what others have used to take the first step and start their online website. Did I miss any popular domain name registrar that should have been on the list? Let me know via comments. Also, make sure to share this list with your social followers and pin it to your favorite Pinterest group board. Great article. There is so much to learn and how well you have explained things. Writing is an art which requires our time and effort to learn it from masters like you. 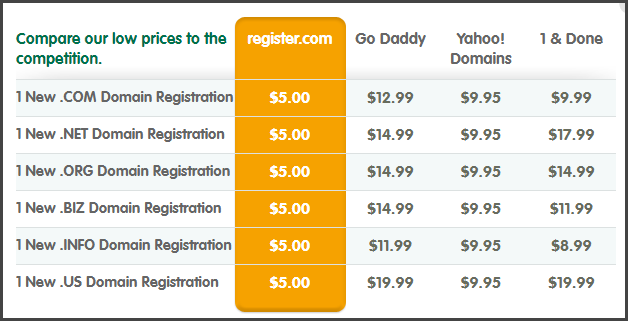 When it comes to buying a domain, my first choice was always GoDaddy. It’s cheap and pretty quick to register a new domain. But gradually my tilt and priority shifted to Namecheap. Wonderful website offering Hosting and domain. Although, their hosting services are a good fit for starters, budget friendly and decent uptime. No doubt, they are the best in Domain industry! Thanks for few new names as well.